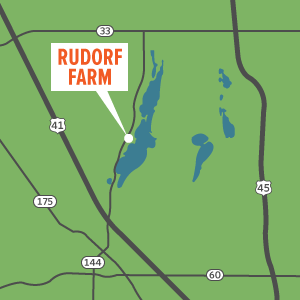 The Rudorf farm is a 93-acre property on the west side of Big Cedar Lake along Hwy 144. Parking is available in a small lot on Division Road, (the southern boundary of the property) about 150 yards off of 144 on the North side of Division. The land was purchased and preserved in 1962 by Sig and his wife “Sparky” Rudorf. They wanted to stop the possible sale to a mining company who planned to develop it into a gravel pit. Sig was an engineer and head of manufacturing at the A.O. Smith Corporation; he recognized that mining the hillside would result in a permanent scar on the eastern crest of the continental divide. Had that happened, the long esker that forms a natural protective frame for the watershed of Big Cedar Lake would have been forever scarred. From the first days of purchase, Sig and his family worked tirelessly to restore the land, planting 40,000 trees and making inviting trails. Sig had had a long friendship with CLCF founder Geoff Maclay that spanned most of their adult lives. Through Mr. Maclay, the Rudorfs became involved with the Cedar Lake Conservation Foundation, and they became convinced that protecting their special farmland in perpetuity was the best form of permanent protection for the watershed. In the late 1980’s and early 1990’s they gifted two land parcels to the Foundation. They also donated land for the installation of a storm water detention basin that protects Big Cedar Lake. In 2000, the Foundation purchased 80 acres with donations from private citizens. Thanks to the Rudorf family and all who contributed, the lovely property is protected in perpetuity.